The day of the demonstration, Saturday, 1st December, was one of perfect southern Australian summer, with clear sunny weather and a temperature about 85 degrees F - perfect Baseball conditions. The ground at the Main Stadium was likewise ideal for play. Fast and thrilling play delighted the spectators who were especially appreciative of the performance of the United States team, which was of exceptionally high standard. Due to the field being set up between the running tracks on the M.C.G. during the Olympics, right field was only 225 feet so special ground rules were put in place, stating that a ball hit over the running track on the full will be declared a home run, where one that bounces or rolls on or over the track, shall be declared a ground rule double. This rule was put in place to stop baseball cleats damaging the track for the events after the baseball. The game was played on 1 December 1956 from 12:30pm. As the visiting team, the Americans batted first, scoring 2 runs off 3 hits from Finch, Pfeffer and Holt. Australia did not strike back until the bottom of the 2nd inning, when Chalky White of South Australia crashed a solo home run to right field off Vane Sutton. Sutton made up for his error in the top half on the 3rd, with a grand slam to send the score out to a commanding 6-1 as Australia was shut out in the equal inning. Neither side scored in the fourth, but the Americans again put the pressure on Australia in the fifth inning as two errors led to another 2 runs to the US, putting them in a comfortable position. Australia got one run back in the equalizer when Tyshing scored after reaching first on a hit to left field, Pratt driving in the run. United States scored three more runs in the first half of the sixth from three hits, and Australia went into the last half of the inning trailing 11 runs to 2 runs—a hopeless position—but a fight back brought three runs to Australia. The game was eventually called at 2:40pm, after six completed innings and a final score 11-5, with the Americans batting first. Very few fans were present at the start of the game, but roughly 114,000 had arrived by the sixth inning. This was due to the finals for the 1500 metres, 4x400 metres relay and finish of the men's marathon. 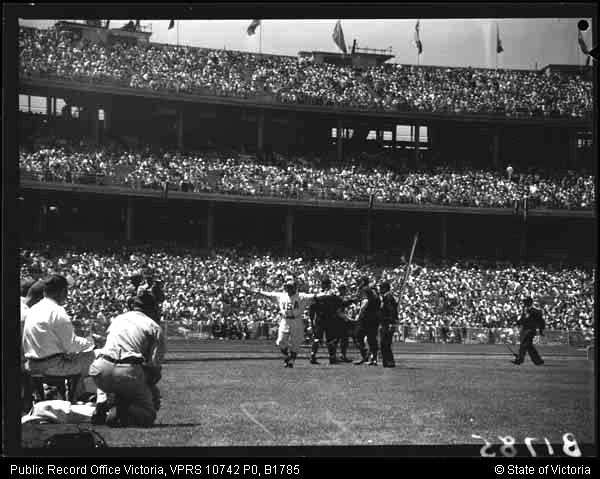 Video of Max Lord catching for Australia in the 1956 Olympic Exhibition game vs USA - close up at around 0:09 - 0:11.